During a remarkable press conference at E3 2016, one of the most surprising announcements is a new IP from a dormant Sony first-party studio, Sony Bend. Introducing Days Gone, an open world, action-adventure, third-person, story-driven, survival-horror game that takes place in the dense forests of Northwest Oregon. 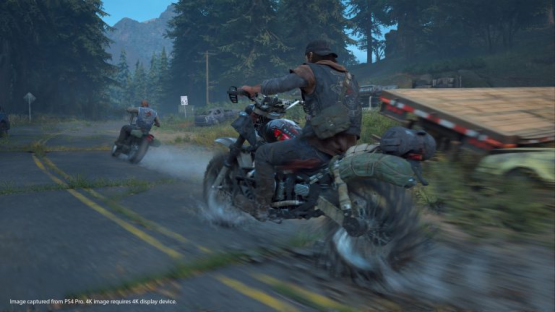 The gameplay reveal highlighted motorcycle vehicle traversal, impressively sized zombie hordes, and customizable weapons. While there was a lot to unravel from that presentation, much of the core gaming community felt unmoved. Another zombie game? Generic biker dude? Stiff-looking gameplay mechanics? This just looked like a tech demo that came a few years late in the console generation. When next year’s E3 came around, more footage was shown that revealed different types of enemies, and the game immediately became more compelling. You can manipulate hordes of zombies (or “Freakers” since they’re still alive) to attack human foes. Humans are naturally more intelligent and calculated than their infected counterparts, so the player, assuming the role of Deacon St. John, has to stealthily execute them by using tricks or sending traps their way. The most frightening addition is infected animals. Wolves hunt you down once they smell you, and bears are terrifyingly powerful beasts to kill when infected. A snippet of the story was given out, but we ultimately know little of the universe until the first hour of the game was posted with commentary from the directors. Regarding the directors of Days Gone, John Garvin is writing and directing the entire project, an impressive feat for an open-world game that he believes lasts over 30 hours in the main campaign. Jeff Ross is helping Garvin with directing the project, serving the role of game director. Both of these guys have worked with Sony since the early days of the studio, back in the Syphon Filter days. Garvin has written or directed several projects for Bend, such as Syphon Filter 1, 2, 3, The Omega Strain, and Uncharted: Golden Abyss. Jeff Ross has a similarly lengthy history with the studio as well, and the overall team appears to have the same skeleton from years past. This long history gave them enough confidence to handle the most ambitious project the studio has ever developed. Another element of development that gave me even more respect for this game is the two delays. Delays often mean the publisher cares about quality more than fulfilling demands from stockholders. Sony decided to push the game back the first time and announced a release much earlier than they usually do. On June 2018, Sony Bend announced the game will be launching on February 22, 2019. After E3, it was discovered that February is quite crowded with major releases, including two mid-scale established IPs and a new one from a major studio and publisher. 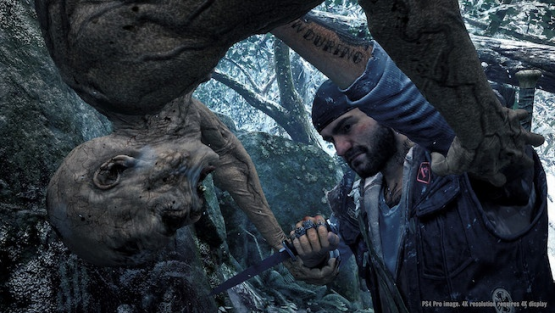 Sony realized the first three months of the calendar year would risk Days Gone being overlooked by the average consumer due to the continuous onslaught of major releases, so they pushed the release date back by two months, making the hopefully final date April 26th. However, many fans and journalists are still concerned that Days Gone would be too traditional of a zombie game for anyone to notice. That said, when you dive deeper into the game, it’s more unique than what people expect. Zombie games typically focus on multiplayer, co-operative gameplay rather than sitting the player down to tell a gripping story. Even when zombie games emphasize story above all else, they often fail to give the player much agency in where he or she wants to do in the world the developers crafted. Dying Light is a single-player game with a story, but the gameplay steals the spotlight and runs away with it. It’s also a first-person parkour-focused game. Now, its sequel has a talented writer on staff, Chris Avellone, so the story shouldn’t be a weakness in the game. However, due to Days Gone being a much different game than Dying Light and coming before the sequel, that doesn’t subtract from Days Gone’s originality. Comparing video games also hardly ever ends up having a constructive conclusion, as it would do both games a disservice. But what makes Days Gone stand out? Well, after seeing extensive gameplay footage and developer commentary, a lot of new information about Days Gone formed a fascinating image. For one, there’s no difficulty setting as Bend Studio hopes to make the game naturally challenging. Your motorcycle can get lost if you choose to park it in one place and depart far enough away to forget where you left it. While you can fast travel to certain cities and place waypoints, it’s important to keep track of your bike, as you can’t summon it back. You also need gasoline to fuel your cycle, similar to that of Mad Max. The motorcycle can also get damaged, which requires you to repair it using tools you can find in abandoned warehouses and whatnot. From the sound of it, Bend Studio appears to have made the bike an integral part of your adventure. That’s just the motorbike, though. Regenerative health is also gone, so you need to craft healing equipment. That’s relatively common, but it’s still a nice addition in a post-apocalyptic survival game. What’s more rare in open-world survival games is accessible buildings. In Days Gone, every single building or structure that has a door in it can be explored. There are also cities and settlements that have unique populations that vary in size. With the promise of universal exploration of buildings, you can expect to feel completely immersed. This amount of detail and effort put into this world gives pre-2015 Fallout vibes, so we can hope Bend makes Days Gone at least somewhat in-depth in terms of world building as it takes notes from a franchise notorious for having deep lore and richly detailed universes. The gameplay has been a source of contention for many gamers. A major criticism is that it looks clunky and not fluid. Similar criticism has been made for Marvel’s Spider-Man pre-release and that ended up having the strongest gameplay of any modern superhero game. Now, Bend appears to have improved the presentation of Days Gone in TGS 2018 footage, removing the XP points bouncing off an enemy whenever Deacon shoots at him. The mechanical foundation of firing your guns remains in place from the latest footage. The enemy variety looks to provide quite an interesting diversity in combat situations. Screechers are female Freakers that alarm Swarmers nearby with their oppressive banshee-like wails, so it’s best to kill them first. Swarmers typically travel in groups, sometimes in massive hordes of hundreds, and they are incredibly difficult to wipe out. Don’t worry though, the map indicates the general location of such hordes, which act as a side-activity. There are children who have turned into Freakers as well, and they hide in dark hideouts, forcing Deacon to enter with great caution. These young Freakers climb walls and ceilings and can easily hijack Deacon from above, adding an additional element of horror. This isn’t Resident Evil horror, but it is a cut above The Last of Us horror. I see myself becoming easily vulnerable in this world. Everywhere you go has some kind of threat nearby ready to pounce at any moment and with the minimalist HUD design, the player can feel truly naked. As of the moment, there doesn’t seem to be any radar system to help the player avoid certain threats. Roaming around mindlessly isn’t the smartest move if you want to survive. Days Gone wants to be one of those games that make you work for survival, similar to Dying Light. Days Gone is the milkshake that combines a multitude of ingredients to give it an intriguing taste. Days Gone seems to aspire achieving Sleeping Dogs levels of game design diversity and versatility. With the inclusion of wildlife becoming infected such as crows, wolves, and bears, the world of Days Gone offers endless possibilities of Deacon’s untimely death. Players need to manufacture several strategies in their heads as they explore throughout the world, similar to Horizon: Zero Dawn. If Days Gone pulls it off well, it could be considered to be one of the strongest open-world survival games of the year. How does the main character seem? While his design isn’t as unique to the eye as Aloy from Horizon: Zero Dawn, Deacon St. John’s character provides an uncommon flavor of a game protagonist. Take his monologue for instance. He frequently gasps and curses with a quivering voice reacting to the world around him. Some would consider that a turn off and view that portrayal as somewhat unprofessional on Sam Witwer’s part, the actor voicing Deacon. However, compare that to Aloy, who, in the base game at least, appears to have an unquenchable arrogance in her tone. She has never been outside her own tribe independently fighting murderous mega machines of death, but she acts like she did this a trillion times before. You can say she’s been training for years, so of course she’ll be somewhat arrogant. Contextually, Aloy’s attitude makes sense, but she doesn’t resonate as well as Deacon. How would you act in a post-apocalyptic world where every creature you know could kill you? Would you say, “Oh, looks like this teddy bear lost his honey jar!” when encountering a zombified grizzly ready to rip you to shreds? Or would you say, “Oh f*ck, sh*t, f*cking bears out to f*cking eat me! Goddamn! Need to find ammo, yeeeaah, need ammo right f*ckin’ now”? Aloy is the chosen-one type hero, which is a fine character trope in a sci-fi game. However, Aloy grew stale after long play sessions. We’ve seen this character dozens of times in fiction, so she’s nothing special other than a cool design. Deacon, on the other hand, is just a man trying to survive this horrific world. He’s a man who lost his wife and his friends from this outbreak. He’s gonna be depressed, agitated easily, and constantly on an adrenaline rush whenever out in the open landscape. Deacon has his own personal politics as well. A gameplay demonstration revealed that Deacon will never kill women even if they deserve it. Why doesn’t he kill women? Does he feel that humanity needs to repopulate and views women’s lives as more valuable than men? For such a minor thing, it does make a big difference. Deacon also has a history with certain settlements. Some are out to kill him, others support him along the way. New settlements or civilization you encounter can be allied or antagonized by the player’s choices and actions. This humanization in an open-world game character is a rarity and should be valued by players, if that’s what Bend Studio achieves with this game. 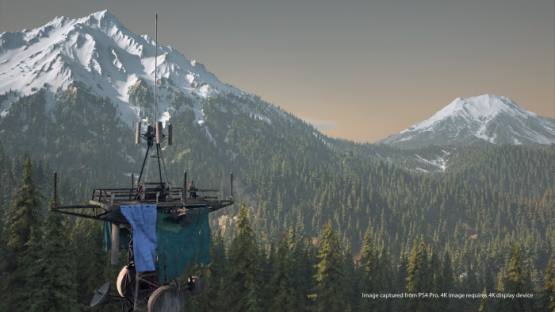 If you’re noticing a trend here, Days Gone holds a lot of potential to be something more than most people expect from it, because it’s doing more than what is asked from a video game of this genre. It didn’t need to have an in-depth alliance system or a large diversity of zombies (or “infected” as Bend so adamantly defines them). The game could’ve been more accessible with difficulty adjustment implementation or regenerative health, but Bend Studio cares more about their creative endeavors than appeasing everyone. Even the more minute details gives the game more flavor than most in its genre, like on the map there’s a real-time day counter of how long it was since the outbreak. This implies that the game might use a Majora’s Mask-style time element. For example, if a gang leader threatens to kill Deacon within two days in some side mission, you ought to keep track of which day he said that and where you should go to prepare for the assault. 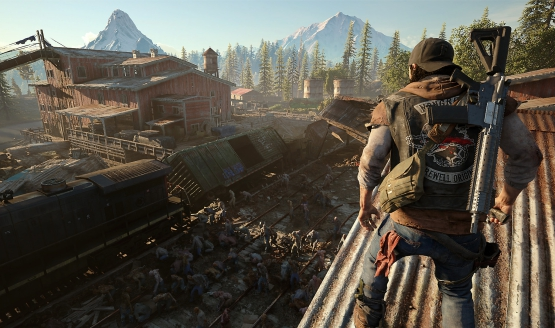 Hopefully, Days Gone utilizes player choice in the narrative. Could you agree to an alliance with a settlement or spark a conflict with them? Perhaps you can barter gang leaders with fuel or other necessities so they don’t kill you or your allies. Could you bolster certain settlements and perhaps become some sort of leader to them? As the days pass in the game, what events could unfold? Would there be a sudden outbreak within an ally’s settlement and how could Deacon extinguish it before it kills them all? How much of the story can be molded by the player’s actions? One would say the large amount of questions concerning the game is an issue, as Bend Studio has not communicated that well throughout development. However, you could view that as the developer’s passion for Days Gone. They probably want players to be surprised with the game they’ve spent a long time creating. Deacon St. John could be a character players can easily connect with. The environment dynamically changes with weather and time of day, and the game’s marketing places an emphasis on the sandbox nature of the open-world. If the world and gameplay is designed to be constantly moving either for or against the player’s motivations, then how could players find themselves bored in Days Gone? Even with the wealthy amount of detail exposed about Days Gone, there’s still so much we don’t know yet. We can expect this game to be an ambitious undertaking, both from a gameplay and narrative perspective. It won’t necessarily be revolutionary, but it could leave a substantial impact on Sony’s first-party portfolio. There’s no question about Sony’s impeccable track record with their exclusives’ quality and polish. Days Gone deserves trust from PlayStation fans and should be given the benefit of the doubt. At the moment, however, all we can do is hope Days Gone will deliver the greatness expected from Sony’s excellent first-party exclusives, and it’s very likely that will happen.